Song details - PALO! 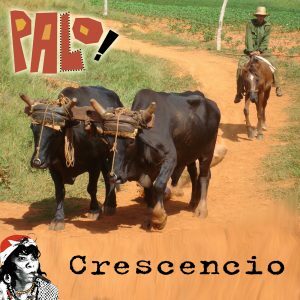 - Afro-Cuban Funk Band - "Crescencio"
“Crescencio” was born from the desire to retell the classic “There’s no place like home” theme with a Cuban twist. I pitched the idea to Leslie and she liked it. Since I’ve always heard Cubans say “Ay, que barbaridad” and that rhymed with “ciudad”, the chorus lyrics began to take shape. Before we could start writing, we needed the person’s name. We struggled to think of a typical Cuban guajiro name, and then it occurred to me: Leslie’s “abuelo” was from Pinar del Rio, and was named Crescencio. Though the song isn’t about him, he was thrilled, and loved to think that the song was about him. We would sing the song to him at parties. The video for the song was dedicated to Crescencio Perez, Leslie’s beloved grandfather, after he passed away in 2011. After finishing the chorus lyrics, we started trying them over various chords and beats, looking for a melody. When I tripped on the bassline, that was it. The pizzicato and bowed violins are my salute to my favorite charanga bands, particularly Jose Fajardo, Larry Harlow, and Hansel y Raul. And the tres loop, played by Manuel Trujillo, gives the song a nice guajiro vibe. Leslie Cartaya becomes a storyteller for this song. When PALO! performs “Crescencio” live, people are enthralled with the way she paints pictures with her voice. I suppose it helps that she grew up in a small town in Cuba, because she makes the images come alive. This song is a perfect example of the sax’s role in PALO! Since we don’t rely on brass arrangements, we replace that with a sax. Of course, this requires a great musician. Ed Calle’s playing on this recording is inspiring. I love the rhythms created by Philbert (congas) and Raymer (timbales). They propel the song without sounding cliché. These two guys, both astounding musicians in their own right, have developed such an incredible rapport over the years that they seem to think as one person! Their sound is innovative, while maintaining a totally Cuban personality.